How did Venezuela’s exchange control wound global companies? When Venezuela, a small country representing a negligible share of the world economy, devaluated its official exchange rate in 2010 the stock value of Telefónica, a telecom multinational with presence in many places in Latinamerica including Venezuela, was hit hard. In 2013, following another devaluation, a number of large US and European multinationals with subsidiaries in Venezuela, such as Colgate-Palmolive, were also hit in terms of the value of their stock. A few years down the road, when the Venezuelan government further devaluated the currency, the story happened again and again. It seems like the markets, time after time, were “taken by surprise”, despite the fact that those devaluations were, arguably, quite predictable. Is the inability of the markets to foresee these devaluations, as measured by the “sudden” drop in the stock value of multinationals active in Venezuela at the time, a pattern that is present in the data? We explored this question in our recent paper “Fool’s gold: On the impact of Venezuelan devaluations in multinational stock prices” (Economia, forthcoming Fall 2018). 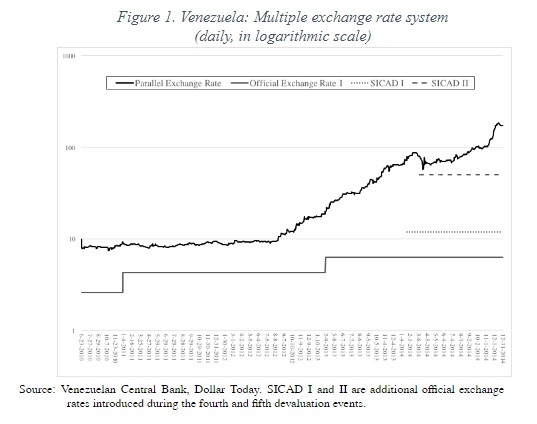 Between 2010 and 2014 there were five major official exchange rate devaluations in Venezuela within the context of a stiff exchange control that has been in place since April 2003. A priori, we would not expect that the stock value of multinational corporations (MNCs) active in Venezuela would be affected by these devaluations, mainly for three reasons. First, because Venezuela is a small economy, representing on average less than 0.3% of the world gross domestic product over these years. Second, because these five devaluations were, arguably, highly foreseeable to financial analysts following the Venezuelan economy, as reflected by the Venezuelan parallel exchange market premium, which remained at a steady rise throughout those years (see Figure 1). And third, because the bulk of the multinational companies in Venezuela were not registered in the commission administering the control, and therefore were not even eligible to purchase dollars at the official exchange rate. Our paper evaluates the stock performance of 110 MNCs owning a minimum 25% share of a Venezuelan subsidiary, in response to five currency devaluation events (see Table 1) using data of listed companies in US stock markets. We do this by employing both an event study and synthetic control methods, finding consistent results across methodologies: Stock prices of these MNCs were, on average, negatively impacted by the devaluations in Venezuela. When using the event study methodology, we measure the change in the cumulative abnormal returns of the stock value of each firm following a devaluation event. We contrast that with a counterfactual based on the correlation between each MNC stock price and the market, as proxied by the S&P500 index. We find negative, significant abnormal returns on the composite of our sample of 110 MNCs, gaping as high a 1.74% over the event window. Moreover, these returns are driven by a large group of 81 MNCs not eligible to acquire dollars at the official exchange rates, which suffered negative abnormal returns in three devaluations, going as high as 2.07%. 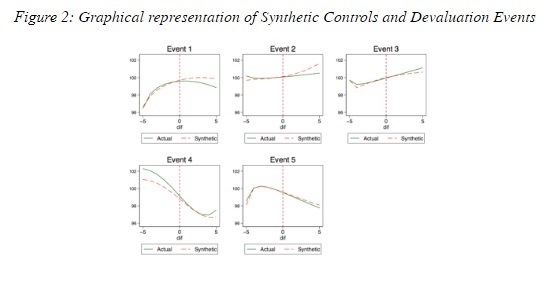 When using synthetic controls, for each MNC in our sample we create a “counterfactual” firm, with similar market capitalization levels and trends for 100 days prior to each event. We then compare the stock values of the actual and the synthetic firm, following the devaluation (see Figure 2). The results show that on average MNCs active in Venezuela suffered a drop in their stock value in three devaluations, going up to 1.68% percent in the ten-day period following a devaluation. The cumulative loss of the composite of MNCs operating in Venezuela on each end of that range goes from USD 37.293 (2011) to 41.295 billion (2014). Our preferred interpretation of these results is market analysts’ myopia, which failed to incorporate the foreseeable devaluations into the companies’ valuation ex-ante. This myopia can also apply other countries with running macroeconomic disequilibria and multiple exchange rates, such as Venezuela during the period of the study, whose particularities are neglected by market analysts. Moreover, the evidence suggests that while analysts where not neglecting specific companies – as our result are particularly prevalent among large companies, usually subject to considerable analyst coverage – they were consistently neglecting the country. Our results at the country-level present a parallel with those reported by a strand of the asset-pricing literature dealing with neglected-firm-effect. Whether our findings conform a wider syndrome – a sort of neglected-country effect – can potentially be fertile ground for future research. There are also some policy lessons from our exercise. Since the parallel exchange rate is neither official nor legal, MNCs translate the financial statements of their Venezuelan subsidiaries using the official exchange rate. By doing so, MNCs comply with current applicable regulations. However, our results suggest that MNCs with operations in countries with exchange control and multiple exchange rates should be compelled to include a disclosure note in their financial statements. In that note, firms should estimate the impact on their assets and profits of translating their subsidiaries’ financial statements at all different exchange rates that may exist. In addition, MNCs must explain which exchange rate or combination of rates is more likely to apply given its legal status.